Every five years, the Washington State Department of Ecology The Office of Columbia River (OCR) submits an updated long-term water supply and demand forecast to the Legislature. The State of Washington Water Research Center leads this effort in close collaboration with Ecology. The 2016 Forecast will help OCR strategically fund water supply projects by improving understanding of where additional water supply is most critical water needs, now and in the future. 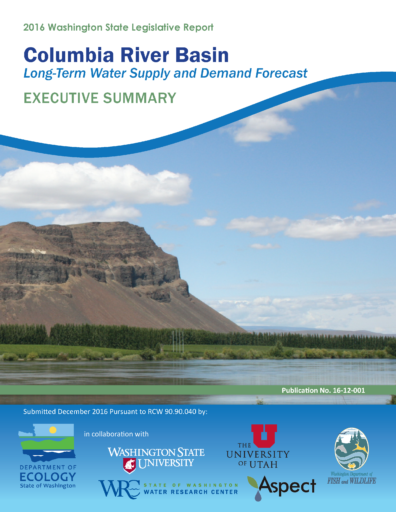 The Forecast provides a generalized, system-wide assessment of how future environmental and economic conditions are likely to change water supply and demand by the 2030s, and is evaluated at three geographic tiers: the entire Columbia River basin, Eastern Washington’s watersheds, and Washington’s Columbia River mainstem. Using state of the art modeling techniques and economic scenarios, the forecast analyzes the impacts of climate change, regional and global economic conditions and state level water management actions on surface water supplies and irrigation demands across the Columbia River Basin. The full set of reports can be found on the Washington State Department of Ecology’s 2016 Columbia River Basin Water Supply and Demand Forecast website.